When trying to figure out how to start this blog I could only think of starting with someone who I was familiar with and whose music I already had a working knowledge of, Bleu Edmondson. I decided to do things differently in that I wanted to start from the beginning with his first album, Southland, and see how it has fared over the years and to see where it has in fact led him. To me it is always amazing to see the transformation an artist makes along the way to becoming who they want to be. 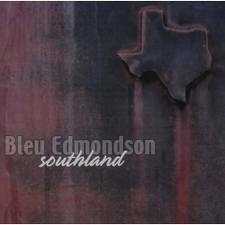 Southland was released in 2001 and was produced by the famed Lloyd Maines which, in its self, is amazing to get a highly respected producer to even consider helping you after only learning how to play the guitar a few years prior. Obviously Mr. Maines saw something in both the man and the music that others did not see. As far as the album goes, it is a solid effort put forth all the way around that produced some great sing along songs, insight into the workings of a young twenty something, and glimpses into where Bleu wanted to go lyrically. “$50 and a Flask of Crown” is not only the first song on the album and his first ever single but still widely the song most associated with him. It is a song penned by Matt Powell who is also a very talented and gifted songwriter/performer and is just a good natured song about hitting the town up big and having a good time. My favorite song on the album will always be “Travelin Man”— not for the scene it paints of driving down the blacktop late at night and observing all that is around you, but more so as just a simple song about wanting a drink and every damn store being closed along the way. This was Bleu’s second single and is a great number to get your feet moving. “It’s About You”, “What I left Behind”, and “Further Down the Line” seem to all trace back to failed relationships that we all go through and the struggles that can be had by someone who chooses Bleu’s line of work. They speak of the past, misfortunes, longing for, and ultimately coming out on top and getting the last laugh. He has a keen wit that seems to always prevail when love has lost. Looking back on “Coming Down”, it may have been the pivotal song on the album. Not from the standpoint of that it should have been a breakout single but from Bleu being able to paint a portrait outside of himself and tell the story of a fictional character. It is very graphic in its portrayal of a man who does what he thinks is necessary to provide for his family though the end result is jail time and postcards from your woman living with her new man. It is not so much the story but the way Bleu was able to see outside of himself and create a set of characters. This was main instance on the album where you saw Bleu painting outside the lines and would lead to some beautifully crafted songs in future albums. A clever ‘ode to the truck driving man’ written by Brian Rung is “Hell on 18 Wheels”. Who knew that truckers and band mates had so much in common but it makes a lot sense when you think about it. “You Don’t Know Me” seems, as a song, to be Bleu’s defense after a difficult breakup. It features one of my favorite lines, “a drunken king with a handmade crown”, and seems to be just a song about a man beating himself up over and over again not thinking he’s good enough and not letting others get close to him because of how he feels. The album is rounded out on a positive note with “Live Oak Lullaby” and “Laughin Right Out Loud” as they are songs about finding new love and making plans for the future as well as sitting around drinking and enjoying the smaller things in life. In the end, it’s certainly not Shakespeare but it is a very solid freshman effort from a man that was young and was trying to find his way in the ever evolving music scene that is/was Texas Country. He has gone on to release three more studio albums and two live albums that are stellar and will be reviewed in the coming future and is a relentless touring act that can now be caught throughout the country.